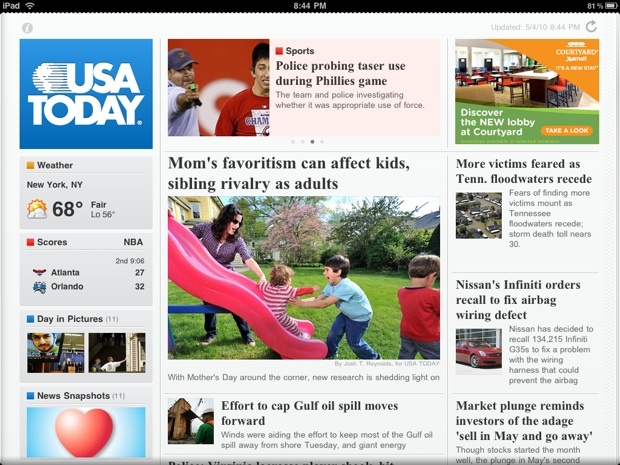 Giovanni Calabro surveys the new face of news design by tracking one story across iPad apps by USA Today, NPR, The New York Times and The Wall Street Journal. 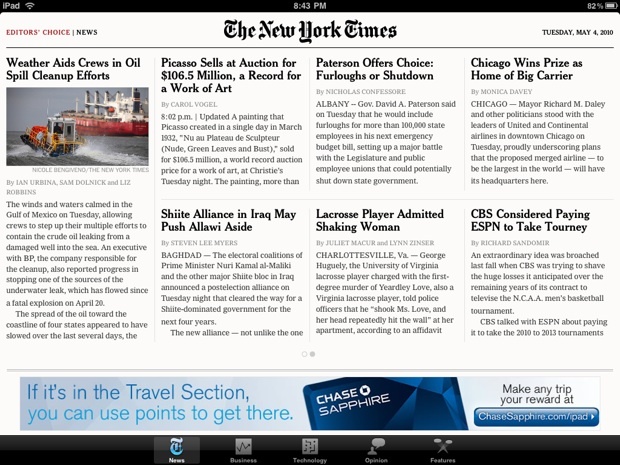 Rupert Murdoch has gleefully announced that the Wall Street Journal hit 64,000 iPad subscribers. Putting aside that these may be free trial subscriptions and his managing editor is claiming 3,200, this is still an interesting development after just two weeks. And how are their competitors adding up? Even with a heavier emphasis on integrated/contextual ad placements, new applications are starting to get … well … interesting. So what’s out there and where’s it going? Start with mobile design. In effect, we are looking at identical experiences. Home pages are photo itemized lists, article pages are succinct, all apps use a perpetual menu at the bottom and small variations ensue. But in the end, content will drive your selection of an app–not the simplicity of use. I was expecting most companies to mimic phone design conventions but larger (even though I was desperately hoping they wouldn’t) and to my shock, USA Today, NPR, and the Wall Street Journal‘s apps broke from the convention! For purposes of comparison, I tracked the Gulf oil spill across all news properties and only held horizontally (even though they all work great in both positions). Right out of the gate we’re already posed with something we haven’t seen in years on a screen (well successfully at least): a newspaper layout. Yes, there’s an ad in the right column, and yes, the design is still more modular than a zoned paper… but this doesn’t look anything like a desktop monitor design. And with that, USA Today carries the experience through in a simple yet useful manner all the way down to their content pages. We start to see a pattern I’m very happy to encounter–three columns! 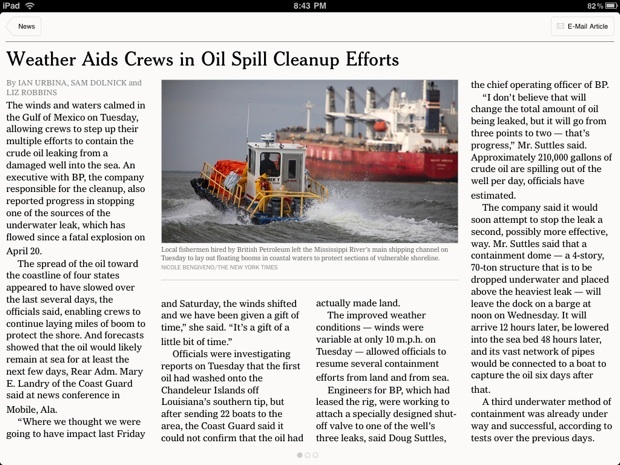 Not Left navigation then Content then Content/Advertising but three columns of text and imagery. 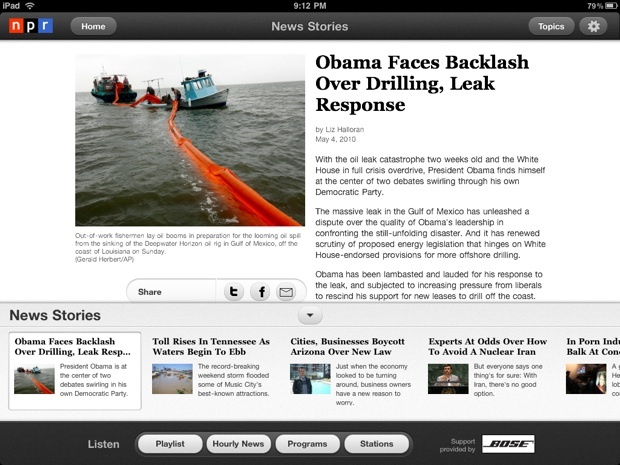 This is a pattern you can see with almost all of the news apps and a welcome one. 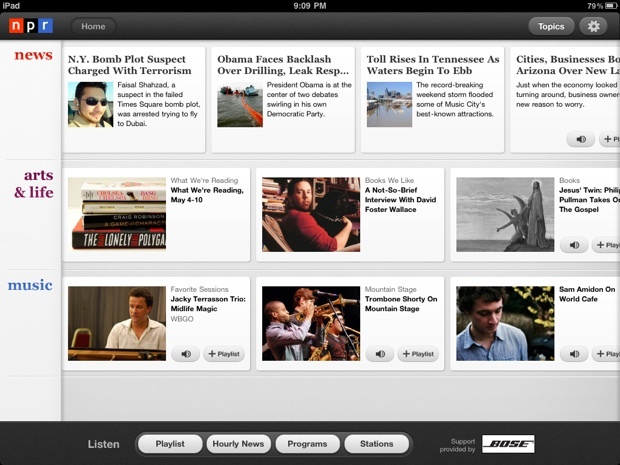 I was surprised to see the traditional homepage design tossed right out by NPR. While I thought this wouldn’t capture the essence of news, it grew on me. Your options are simple: News, Arts & Life, Music. Done. Scroll left, scroll right select. Refreshingly easy. 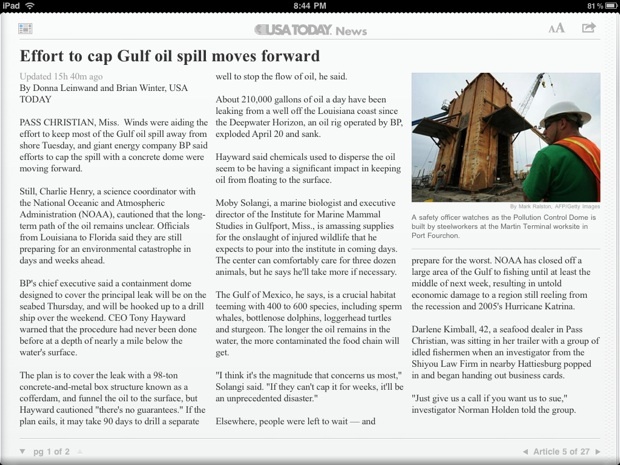 NPR’s content pages were great at cross promotion of content with the collapsible content bar at the bottom, but didn’t actually use the full screen for the display of their content which is very apparent when reviewing the other news apps. NPR leaned heavier on social media promotion as well as a very light handling of advertising via sponsorships. This layout helped me realize how much I don’t mind more aggressive advertising when it’s built into the product appropriately. Oh me, oh my. With a publication that’s as deep and robust as the Times, I’m hoping their news app is a temporary placeholder until they break from contractual obligations with Amazon’s Kindle. If that’s not the reason, it’s time to catch up. As an aside, Steve Jobs agrees with me. 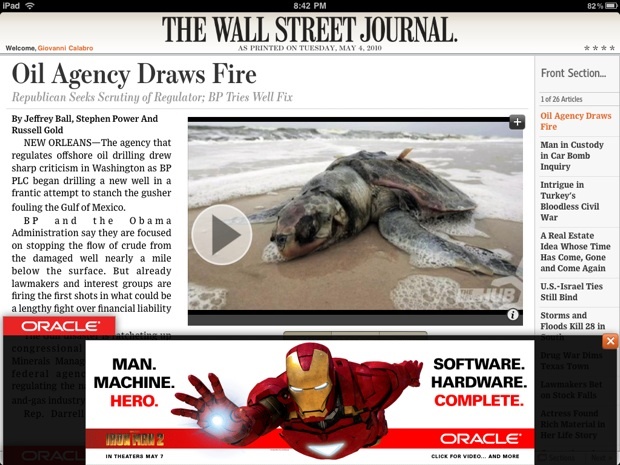 And the winner (even though I don’t want to blow up Mr. Murdoch’s head even more) is WSJ. They clearly took the time to visualize an experience for the iPad that blows everything else out of the water (and it should, at its ridiculous subscription of $18/month). From WSJ‘s first screen that offers the last nine papers you’ve downloaded, a saved articles section, my watch lists, and saved sections, to the deeper thinking around whether a finger swipe left and right should progress between articles vs. a pinch to close an article or section, they really thought this one through! The heart of any news organization lies in its content page. Whether it’s an article, video, photos, graphics, or audio, content is what draws an audiences. And ensuring that you can give your audience what they’re looking for, while cross promoting other valuable and contextual content is a win. 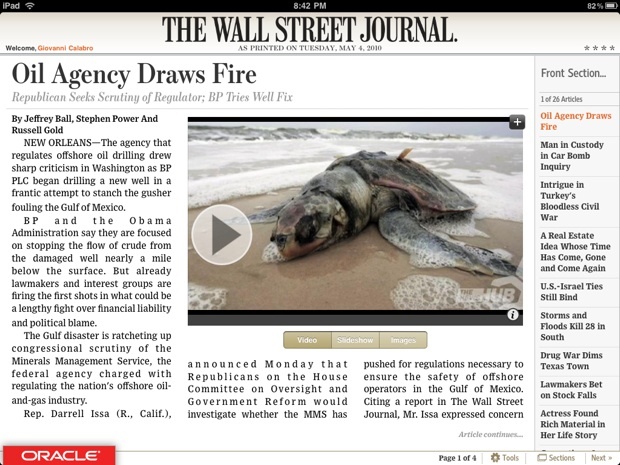 WSJ not only achieves this but telegraphs clear as day that you can interact with content (like the video above). 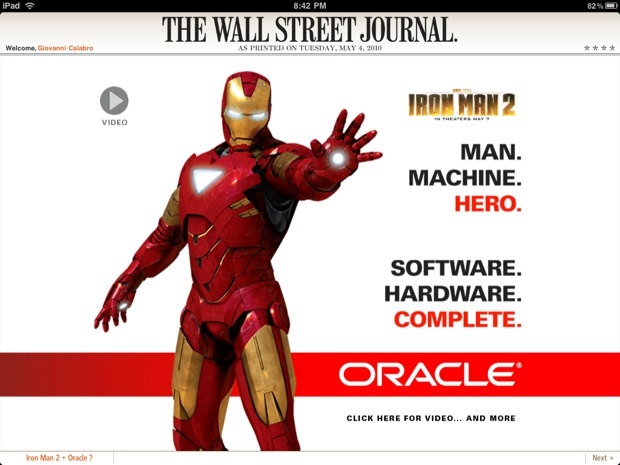 And not to say others are not doing this similarly, but WSJ managed to make me satisfied with $18/month in subscription costs and inline advertising that is appealing (yes, I watched the Oracle video). 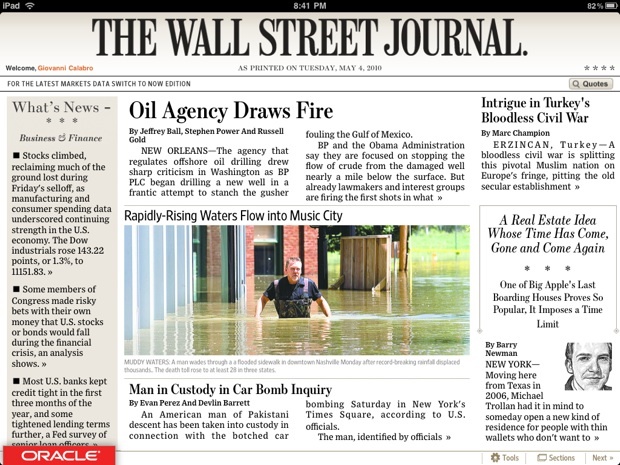 The Wall Street Journal and USA Today iPad apps show experience and design do not have to be dictated by IAB standard ad units. (NPR doesn’t really play in the world of display advertising so they get a pass.) It seems there’s a shift in business models from measurable display ad buys to brand buys, which is more like television, and the iPad is waiting with open arms. This makes sense too if you think about how those million iPads Apple sold in the first month were bought by people who can part with $500+ (influencers). That’s quite a compelling audience to reach. There’s way more to do here–using my geo location to personalize relevant content for one–but we’re off to an interesting start as more publications begin to find their way to this new Shangri-La of news design.